Drug court is last chance for many! Those participating in the drug court are carefully screened and must meet certain criteria, according to Dianne Warren, the coordinator. "The drug court is a voluntary program for non-violent offenders who are chemically dependent or addicted to drugs and have not been successful in staying clean otherwise," she said. "Eligible offenders enter into what we call a diversionary program which means they go before a judge and enter a plea of guilt," she said. Sentencing is delayed. "Since January we have graduated seven and terminated one for non-compliance. Right now we have 17 in the program. We have arraignments and plea dates in October so we will pick up some then," Warren said. "If you help one person through addiction along the way you feel like it is worth it. It is a wonderful program if people take advantage of it. It is an intense program. I keep tabs on them while they are in the program," she said. Sometimes they think they find ways to trick the (drug) tests but she said she can usually pick up on it--it is something you learn to pick up on, she said. Warren reports to District Judge Clay Tinney. "I think it works when you have people who want help. It doesn't work for everybody," Judge Tinney said. "Mrs. Dianne does a good job keeping up with people. It is kind of like babying them along." "We see a lot of repeat folks in general--not in the program. It is a big issue with the prison system. It does keep people out of the prison system. The diversionary program gives them structure to try beat their addiction. It is a lot of handholding, providing services, getting them to drug counseling," he said. "When they mess up we can sanction them with progressive sanctions. If they are not in-patient we can get them in-patient," he said. Termination is possible--people know when they are on thin ice. The offenders have to make an application when they come before Tinney. He informs them of the program and if addicted they apply but there is no guarantee they will get in. The Drug Court Team is made up of Warren, Tinney, assistant district attorney Amy Newsome, criminal defense attorney Sara Bragdon, the sheriff, a Department of Human Resources representative, treatment providers Cheaha Mental Health and Phenix City Court Referral, court referral officer Emily Duerr, school superintendents Rance Kirby and Chuck Marcum, Jeff Burns, pastor of Trinity Baptist Church, and other members of the community. "We always have a good variety of community service supervisors," she said. The applicants are individually interviewed in front of the team. Everyone else leaves the courtroom. The applicant's attorney gives information and background on the defendant. Team members can ask anything they want, such as what is your drug of choice, or why do you think drug court will be good for you. They are asked to wait outside and the team discusses the case, then takes a vote on whether to admit the applicant to the program or not. Warren said initially they run the application by Newsome and the arresting officer so they can research it and see if there are objections. If Newsome and the officer strongly oppose the applicant may not get into drug court. As the cases are presented to the team it has been an eye opener for some on the team, she said. Once participants are chosen they are given exact guidelines, such as not being allowed to be around criminals or anyone using drugs or alcohol. Participants are not allowed to take addictive medications, even prescribed medications. If the doctor says the person has to have a drug he has to bring something from the doctor. Tinney said team members at large give a community-wide perspective and work pretty closely with them to provide a lot of knowledge and support. They are not re-inventing the wheel--it is something done a lot of places, similar to community corrections. Drug court started in 1989 with the crack cocaine problem in Miami-Dade County, Fla. All 50 states have drug courts, a total of 2,400. They treat about 120,000 but an estimated 1.5 million eligible people are currently before the courts. It is reported for every dollar spent on drug courts it yields more than $2 saved for the criminal justice system. "New prison reform was just passed by the legislature trying to address addicts who are going to end up in the Department of Corrections if it is not addressed. That is why district court is so important to get people (from) clogging up the system," Tinney said. He has been dispirited when someone he thought would make it didn't. He thinks it is a life and death situation, especially for a younger person. Warren said when an addict uses drugs for a long time it affects the brain, often causing hallucinations. Sometimes the brain does not return to normal. Friends and family support makes a difference but not to the point of enabling them. Sometimes you can love them to death, she said. The success stories keep Warren going, such as the guy who said drug court saved his life. He had hit rock bottom, lost his business, lost his family. He asked to be in the program. He is working full-time and got his wife and children back. He comes by and sees her occasionally. "He's happy and he's doing great. He still attends AA/NA meetings weekly and he has a sponsor who helps keep him accountable. He said he has hard times occasionally but his boss is very supportive. They will get out and ride and talk and get him through it," she said. "Recovery is a day-by-day process and from what I understand once a person is an alcoholic or drug addict he is always one. It is one day at a time for the rest of your life," she said. Methamphetamine is one of the worst drugs but prescription drugs, especially hydrocodone, are right up there with meth. There are two or three marijuana users--the drug does alter your thinking. Cocaine is a bad one. She has not personally seen any heroin users. Meth is the prevalent one. "Drug addicts go to any lengths to get the drugs they want. They will steal and kill--steal from their parents," she said. Another problem is parents, not meaning to, enabling their children. Their son asks for $20 for a sandwich, then buys a hit with the money. Offenders can apply for the program at different stages, sometimes after the initial arrest or sometimes at the circuit court level. Usually they pick up the most at arraignments or plea dates, she said. The program is a minimum of 12 months but it can be longer depending on how they are doing. They have to successfully complete all their requirements, which include reporting weekly to her and monthly to the judge. To successfully complete the program they have to report as they should and complete in-patient or out-patient treatment, whichever is called for. An assessment determines the kind of treatment. Sometimes out-patient treatment is revoked if they test positive so if they cannot stay clean they are put into in-patient care. She has one in jail waiting for a spot for long-term treatment. Most of the time people have to wait two to four weeks to get into a facility. 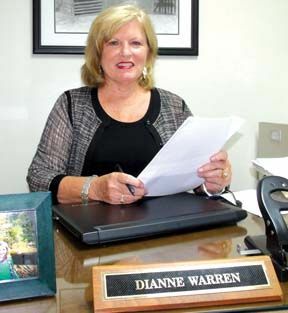 The drug court was implemented in 2009 and Warren coordinated it the first year. In 2013 Judge Tinney revamped the program, re-worked the policies and procedures, and made it a completely voluntary program. When the program is successfully completed the sentence is dismissed. The cost is $175 a month. When people come into the program Warren stresses looking for a job. She shows a form they must fill out detailing their job search: where they go, the person they contacted and the result. ReLintLess in Roanoke has worked well with them as far as jobs go. "We work with them on paying. Most make minimum wage. The monthly payment is part of their punishment. It is $2,100 a year for participants who complete the program in a year. While it is not mandatory to pay fees while in rehab or a halfway house if the participant does that he will receive drug court credit for the time spent there. He cannot graduate until all fees are paid, including victim restitution. The offender is required to get a GED if he does not have a diploma. He must be completely drug and alcohol free the last six months of the program. He must be a student or gainfully employed and complete community service, if required. Offenders can be dismissed from the program if they get new charges. There can be no association with anyone engaged in criminal activity and cannot possess firearms or any other requirements the judge puts on them, she said. This is a three-phase program and the first phase is three months. There are random drug tests once a week. If someone does not follow the requirements he is sanctioned, which can be for an infraction like being late for an appointment, missing out-patient treatment or missing community service. Some of the other requirements are having a 10 p.m. curfew and attending a 12-step support meeting, such as Alcoholics Anonymous or Narcotics Anonymous once weekly. Phase 2 is three months with changes such as 11 p.m. curfew while Phase 3 is six months with a change such as 12 a.m. curfew. Anyone who tests positive for drugs or alcohol anytime in Phase 3 begins a new six-month period. There are sanctions for not complying with the program including jail time and dismissal from the program. If the participant does not successfully complete the program he or she returns to court for the delayed sentencing by the judge. The program is funded by a state grant. The amount varies. Last year they got $30,000; this year they got $10,000. The program is also funded by participants' fees.